I am in love. Sooo in love. Sometimes when you knit something you manage to get the pattern and yarn combo just right. I think that I managed it with this project. I teamed the gorgeous Madelinetosh Vintage yarn in Baltic with the stunning Snapdragon Tam pattern by the ever clever Ysolda. And, snap! A winning combination. This is no easy knit. In fact I might go so far as to say it’s a pattern for at least an intermediate or experienced knitter. Nothing is difficult, just that it’s an intense knit, with travelling stitches, cables and increases and decreasing happening in practically every row once the ribbing is done. 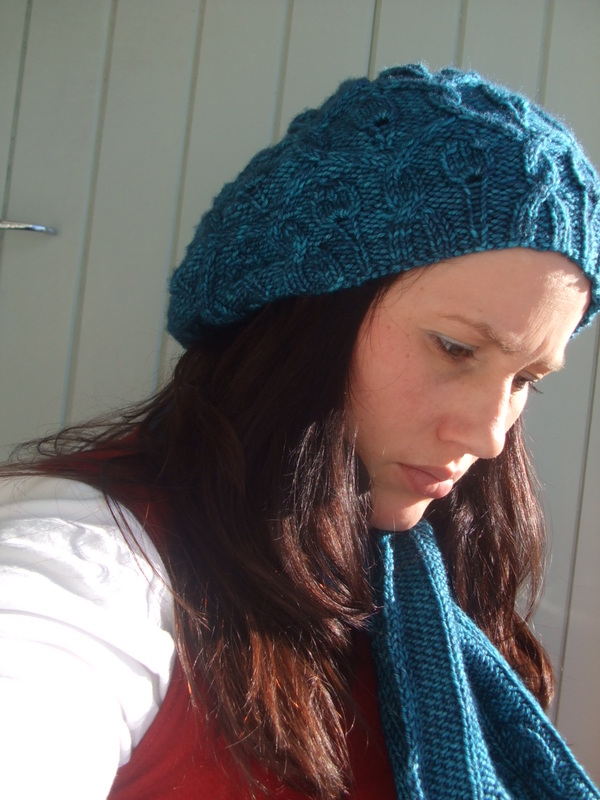 The result is a densely knit hat that will be cosy and warm. 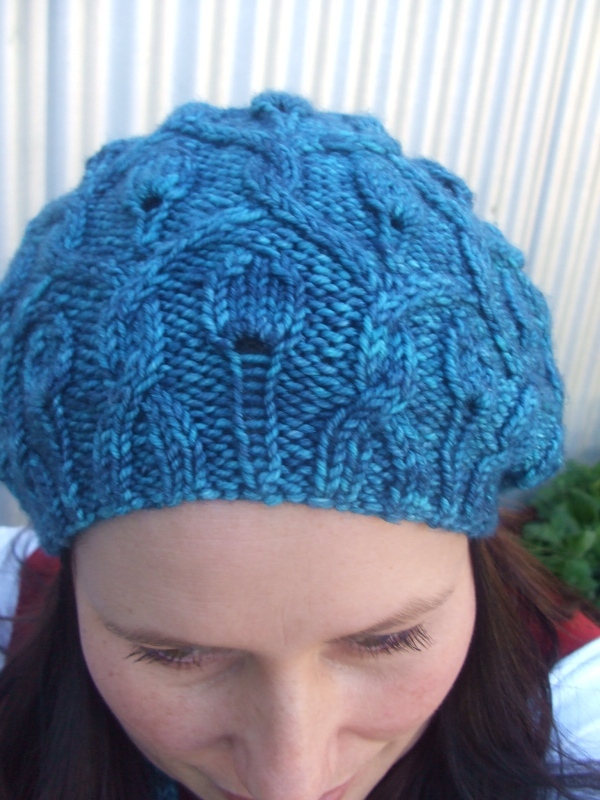 The work shows too – you can see lots happening in this hat and I think it looks like an impressive knit. It is a well balanced, well designed pattern. 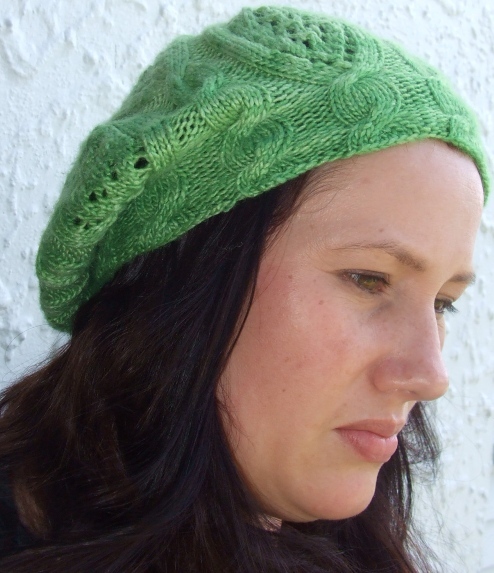 Like the previous beret pattern I knit by Ysolda, this is an incredibly well written pattern. It is an easy to follow pattern. There is a choice between written and charted instructions. I used the written instructions, and it was simple to follow. It is the kind of pattern that is logical and you can see instantly if you have gone wrong and spot the mistake and it’s fix immediately. Add to that the fact that it is beautifully presented and you get a huge recommendation from me. I bought the pattern as part of the book Whimsical Little Knits 2, which is available in both hard copy and as an e-book. Mine is an electronic copy, and I love several more of the patterns. There is a pair of mittens to match this hat, although I don’t intend knitting them – I’m more of a fingerless gloves kinda girl. I used just over one skein of yarn to knit this. I knit the middle size in the pattern, and it is too big – so I should really have knit the smaller size. I threaded some shirring elastic through the ribbing and it has made the fit perfect. But it was a good reminder that I should remember to measure rather than guess in the future! Picture this. It’s around 5pm on Sunday afternoon when DH turns on his computer. He has a diary function on it which prewarns him of upcoming events. He announces it’s his mother’s birthday on Friday. I think in future it would be nice if he set his computer alarm function for a couple of weeks in advance! I take no responsibility for not remembering her birthday, we’ve only been married five years. I fossicked in my stash and came up with some 4ply Touch Yarn, variegated in a selection of delicious dark plum, rust, grey and greens. 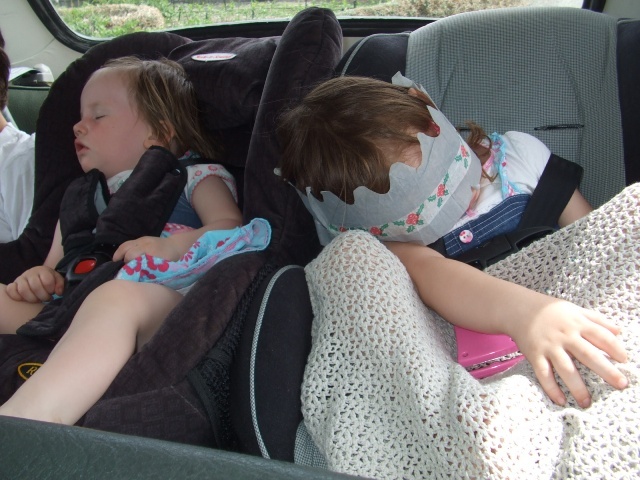 After a bit of help winding from my friendly local toddlers, I was ready to go. The first part of the pattern is stocking stitch and it just flew by. I can’t say I enjoyed the second part as much. For some reason the lace sections did not click with me and I did a lot of pattern following. I might be the only person in the knitting universe not in love with Ishbel. Don’t get me wrong, she is cute, but it was not an intuitive knit for me, which is something I love. By 1pm she was ready for a quick bit of modelling and then ready for wrapping. It feels good to have it finished, but alas there is no hope it will make it to her in time for her birthday. I deputised DH to take it to the postoffice, and he forgot the crucial bit – fast post! So, the lovely Ishbel is making her way s-l-o-w-l-y to the South Island. Sorry, couldn’t miss my chance for a Shakespearean reference there, could I? Anyone other than me know which play (and character!) these lines are from without cheating? Yes, Google is cheating people! In this case, I’d be refering to my new beret, knit to Rose Red by Ysolda Teague. And, the pun comes to life for me a bit because the yarn I used is another rose – Damask Rose Malabrigo Worsted. My last yarn purchase before my self imposed ban was an order of Malabrigo, and I was gutted to recieve an email from the retailer saying that between me ordering and her packing the order, the last skein of damask rose had been sold. However, I scored just over a skein (prewound into balls even!) from someone destashing on Ravelry, so that eased the pain. Even if the arrival of the parcel did evoke a “Not more yarn” from my husband when it arrived. I knew that I wanted to knit myself a hat with this gorgeous yarn. I wasn’t sure which hat though. See, the thing is, I’m not much of a hat person. I’m not sure if it comes from having to wear a hideous woolly school hat complete with pompom in my childhood, from having to wear hats to church in childhood, or the fact that a girl with straight hair and a fringe struggles to look good in a hat, however attractive. I’m just not sure. But I am all grown up, fringe grown out, and in need of something to ease the cold at a Saturday morning soccer match. And this isn’t unflattering, it’s just my hat complex that stops me from gushing. So, my inital plan was to use something from my stash to knit up a plain beret to see if it suited, but my lovely yarn was calling to me. 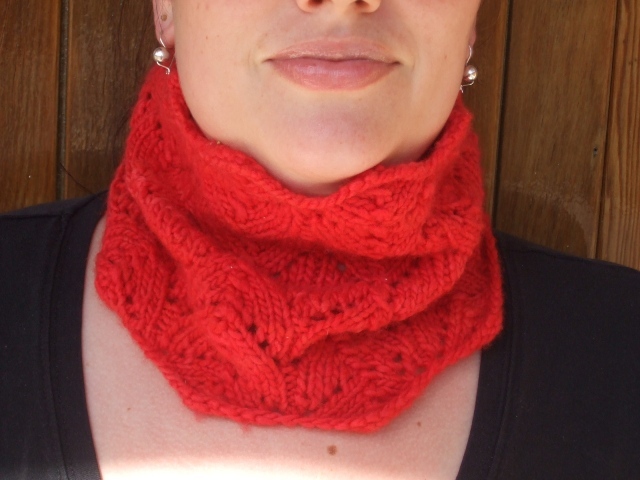 After some time browsing patterns on Ravelry, I decided upon Rose Red. 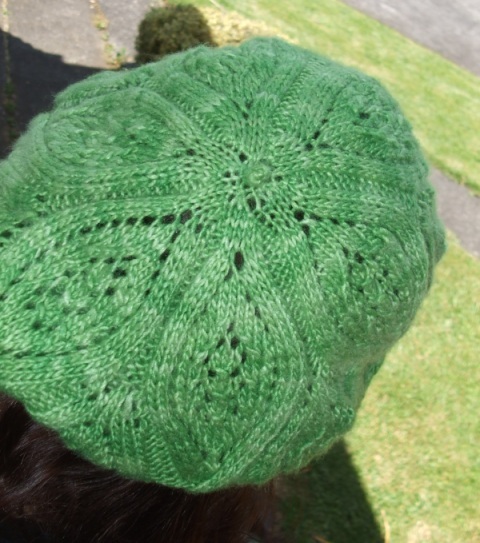 I enjoyed my last Ysolda knit, and she has some seriously cute beret patterns. I love being able to look up other people’s projects on Rav and see how yarns look knit up in them, and so I decided that even though the pattern called for 8ply, I would likely get away with the worsted weight. And I did! 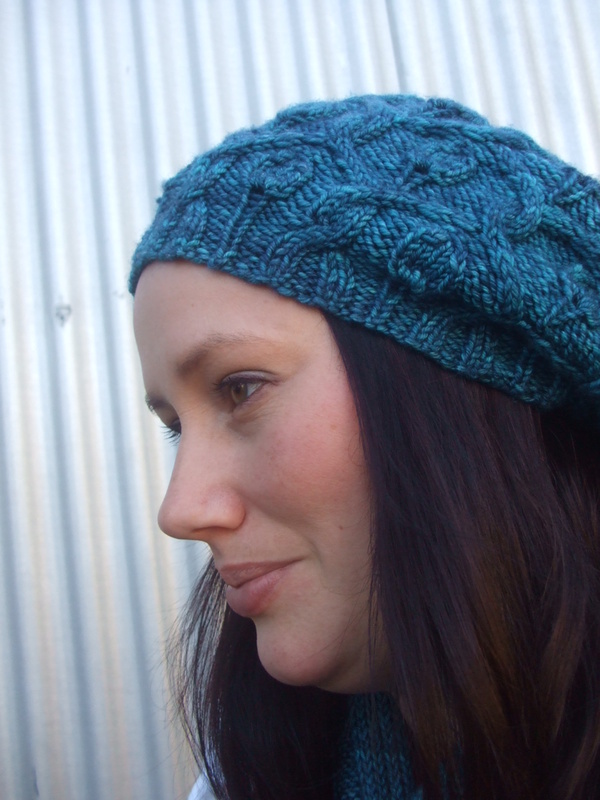 I love this beret, not sure how much I love hats, but OMG, if you want a stunning pattern, this has got to go on your list. The detail on the pattern is incredible – each row is written out as well as charted, so even though it is a challenging knit, you’d have to be even more of a moron with lace than I am to stuff this up. Knit in the round from the centre outwards, you start with a stunning petal pattern, working your way outward to cables. Ysolda is one seriously talented designer – all the increases are incorporated into the petal pattern, and it just flows so easily. If having to watch your pattern constantly is easy anyway! I actually think this is my first lace knit that I know is 100% correct -that’s right, I’m not aware of a single error or anything I ‘fudged’ to make my stitch count right – it really was intuitive, on the couple of occasions I had made an error, I was able to quickly see where it was an fix it. Yay me! 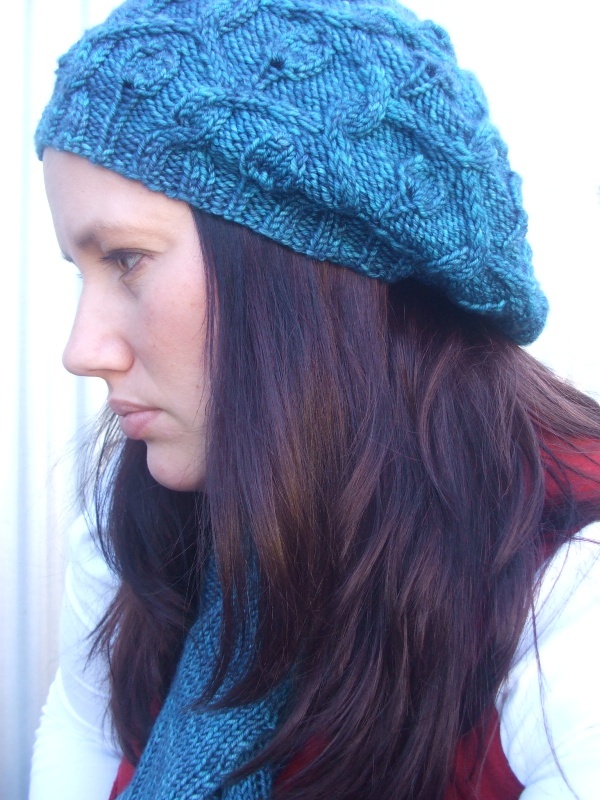 I’ve had my eye on Ysolda’s pattern Liesl for some time now. Knit in 12 ply yarn, it was always going to be a quick knit – I think that lots of NaKniSweMoDo participants will make at least one Liesl this year 🙂 Of course I wasn’t motivated by the speed of the project (much!) But it is an extremely economical knit, my version knit for the 46 inch bust size took just 750m of yarn – a tiny bit over 10 balls of Shepherd 12 Ply 100% Lambswool Felted. The shade ‘106’ was one of two on sale at Knitworld in January and I bought 14 balls, intending to knit another Shalom. However the fact that I could knit the Liesl with sleeves meant that I changed plans for the yarn, and I’m glad I did. Another cardigan is going to be perfect for this autumn and beyond. And at $3 a ball, this meant a 100% wool cardigan finished for under $35. That aside, I hope that you can see the beauty in this project. I adore the undulating line that the feather and fan lace pattern creates at the hemline. The pattern is great, giving lots of options: a high neckline, or the lower one I chose, button hole options ( I am thinking of buying a fourth button though, it’s a wee bit gapey… and I think the garter stitch band will stretch to admit a button), and lots of different lengths. It is knit top down in one piece, so no seaming is required – this has got to be my favourite sweater construction method! I chose to make mine with long sleeves, but I can see myself knitting another one later on with short sleeves. For the record, there are 20 lace repeats on the sleeve, just in case you’re knitting one and want to know how many you might need. I was impressed with the pattern too. Ysolda is a young, independent designer who self-publishes her patterns. The layout and accuracy of her pattern was fantastic, and the photographs to illustrate the pattern were fabulous, I found that they were clear and helped me when I was struggling with the inital rows (silly me – obviously I should just read the pattern!). It was great to see the garment modelled in a size other than the smallest size too – very inspirational. This particular pattern was cleverly designed with minimal counting and easy increases. No stitch markers or head scratching required (once I had the pattern sorted out). From cast on to cast off, it took 8 days – including time to knit and assemble a teddy bear and knit a sleeve and half a back of the Whisper cardigan. I think the fact I got gauge on 8mm needles might have had something to do with that though!